The next morning we had an Argentinean-style continental breakfast at our hotel before heading down to the port. Their we saw a Russian expedition ship being prepared for its voyage to Antarctica. 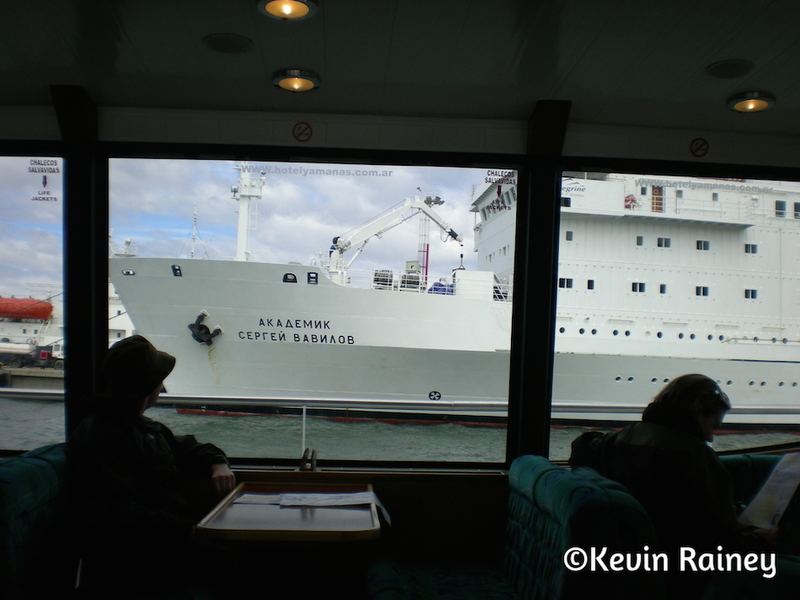 Her name was the Akademik Sergei Vavilov, and she looked like the kind of ship we would like to take one day. After walking along the docks, we arrived at a catamaran that would be taking us on a tour of the Beagle Channel. 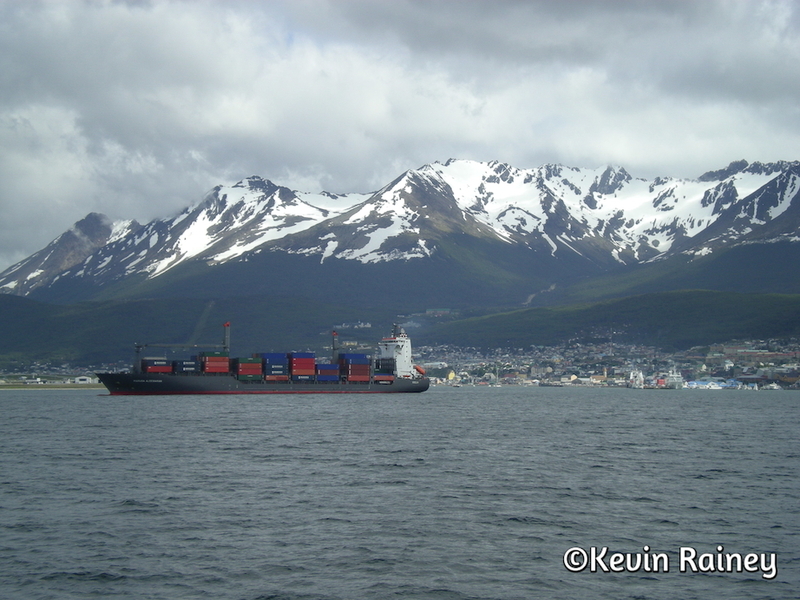 We boarded the B/P Francesco and headed east down the Beagle Channel on a scenic cruise. Organized with the company, Canoero Catamaranes, the catamaran offered narration and snacks along the beautiful cruise. The guides explained how Argentina’s Provincia de Tierra del Fuego also includes Antartida e Islas del Atlantico Sur – Argentina’s claims to Antarctica and the South Atlantic Islands. The Beagle Channel was named after the English ship, the Beagle, on which traveled Charles Darwin. Although the channel is notorious for storms and bad weather, it is considered a much safer passage than rounding the more southernly Cape Horn – the tip of South America known as one of the world’s most dangerous crossings. Along the way we made a stop on an island with good views of the canal. There our guides told us about the Yaman people who used to inhabit these islands and surrounding areas. The indigenous people we were know by the Spanish, Portuguese and English settlers as a tribe that always had fires going – thus, giving the name to the Land of Fire, Tierra del Fuego. The European sailors found it peculiar that the tribes wore hardly any clothing in such a cold environment but seemed to always keep warm by well-tended campfires. We passed a beautiful faro, or lighthouse, that was one of the most southernly in the world. We saw a huge colony of sea lions making their home nearby. 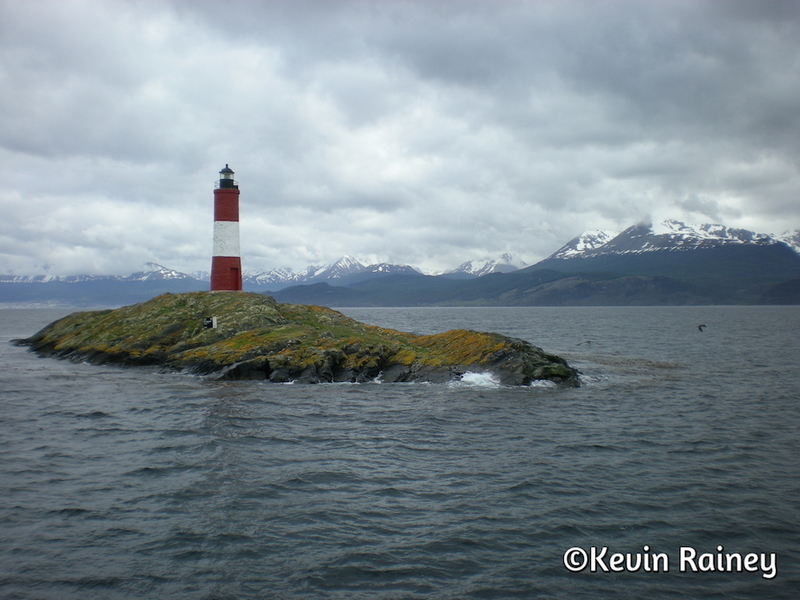 Our guides pointed out Isla Navarino, across the channel which forms part of Chile and also contains Cape Horn. The mentioned that Puerto Williams on the island is a small Chilean town that, like Ushuaia, claims to be the southernmost town in the world. As Argentines, they explained that Puerto Williams was more of a town while Ushuaia is a proper city. Upon arrival back in Ushuaia, we received our Beagle Channel sailing certificates, or Certificados de Buen Navegante. 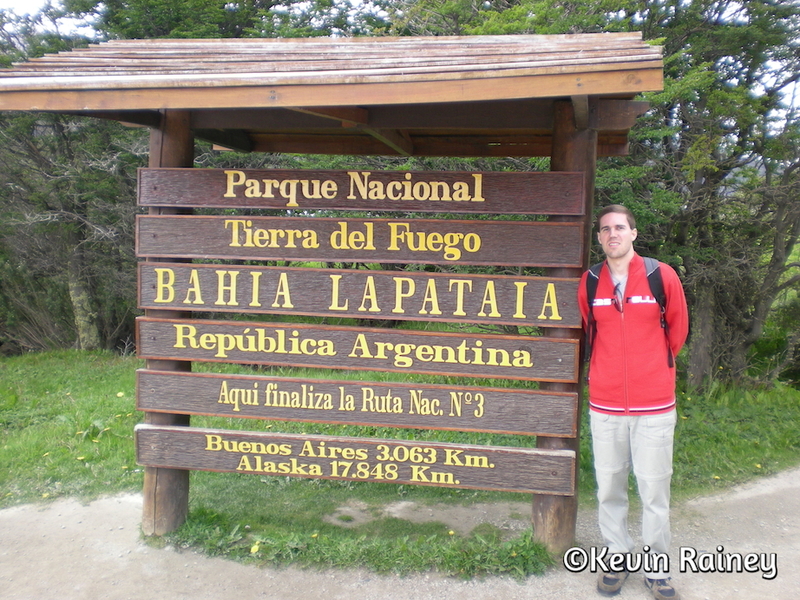 After lunch in Ushuaia, we took a bus to Parque Nacional Tierra del Fuego. The park was Argentina’s first coastal national park and is know for its great coastal hikes. We headed down to Bahia Lapataia, Lapataia Bay, one of the most picturesque parts of the park. This is where Ruta Nacional 3, one of Argentina’s longest highways and one of the longest highways in the world ends. More importantly, this is where the roads end in the Americas. A signed proclaimed the distance to Buenos Aires as almost 3,000 kilometers and to Alaska as more than 17,800 kilometers! We admired the beautiful bay surrounded by beeches, winterbarks and firebrush. We even saw some ducks, petrels and albatrosses. That evening we had dinner again at outstanding steakhouse. Again, the choices of tasty Argentine beef were overwhelming. We did a little shopping that evening before heading back to the hotel.